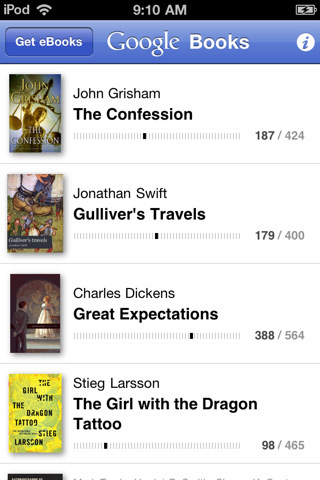 Google Books for iOS arrived in the app store earlier this month, and while many thought the platform might have stolen the thunder of any other reader app out there, it looks like Google is just another decent drop in the bucket. 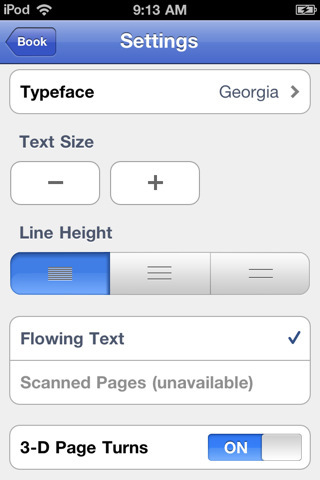 Fire up the app and you’ll find a simple, seamless interface. The books in your library line up as thumbnails and title rows, and the upper left hand corner contains a button that leads you to the Google ebookstore. The first time you open the app you have to sign in with your Google username. This allows you access into the Google books platform from just about any device so that you can buy books and read selections from your iPhone, iPad, laptop, or Android. The bookstore button within the app takes you to a Google bookstore website, and while this isn’t technically part of the app, it’s worth talking about for just a moment. Google eBooks looks a lot like Google’s search engine with a touch of Amazon. The top part of the page is a search engine and the page below is broken down into featured books along with the price, ratings, and a get sample button. You can browse categories (including free books), and when you buy a book or get a sample it ends up in your library. From there you can choose to continue shopping within the browser or toggle back to your app where the book loads in your library. The whole process of buying and downloading is clean and seamless, and the Google eBookstore has more than 2 million titles. Actually reading in the app is decent, but not flawless. The reading aspect has everything you might expect, from a table of contents to day and night settings, typeface options, and line height and text size modifications. There’s also a search button that lets you find specific passages, and an information button that reveals the details of your sample or purchase. Turning the page is your standard run of the mill swipe motion with animated flipping, but sometimes the pages take a split second to load, which can interrupt the reading process just a little more than you’d like. 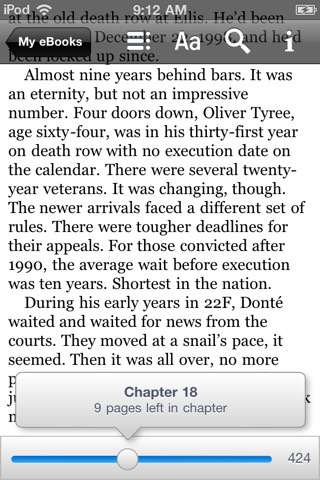 My other quip with Google Books is in the portrait only mode. It’s great that Google Books gives you the flexibility to sign in from just about any device and set into reading, but if you want to read from your iPhone it’s portrait mode or nothing. All said and done, Google Books is decent. It’s clean, straightforward, and fairly well executed. Now we just need something that’s going to blow us away. Bottom Line: Google Books is a solid reader and eBook store interface for your iOS devices, but the search magnates haven’t really given us a reason to switch over permanently yet.